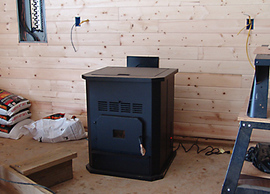 A couple of workmen showed up a week earlier than expected and installed a pellet stove in the workshop. This smart little beauty throws off a large volume of warm air and will keep the workshop comfortable with none of the hot spots that occur with a conventional wood stove or fireplace. It provides variable pellet feed for temperature control and a variable fan speed for heat distribution. It is a highly efficient heating unit and it is supposed to run for several days on one hopper full of pellets. When we have used it for some time I will be able to give you a first-hand report on how cost-effective it is as a primary source of heat. The hearth I built yesterday has already been tiled by a helpful young fellow from Dehart Tile in Christiansburg. This is a two day activity. 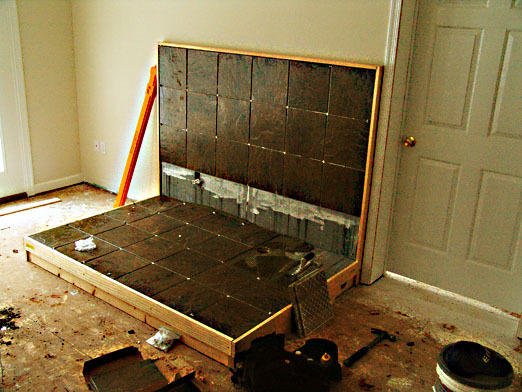 On day one, the tile is set in place. On day two the tile is grouted. As you can see this tile will make a dramatic backdrop for the woodstove we will install on this hearth next week. I have a great appreciation for the contractors I have met in the course of building our new home and workshop. They have been working at great speed, even in in freezing weather. The only thing that seems to slow them down is getting so much snowfall that the roads are impassible. 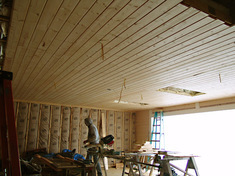 The workshop is being paneled on the walls and ceiling at the suggestion of our contractor. The 3/4 inch thick pine panelling is six inches wide and comes in 20 foot lengths so it goes up quickly and provides a continuous surface for secure attachment of shelves and racks that are a necessity in any workshop environment. It also looks stunning, even though it is only one third complete. According to our contractor the installed cost will be about the same as for drywall and this panelling will be much more useful in a shop environment. I am returning to Lake Monticello tomorrow to help Gretchen with the packing. We have only a few days to get all of the boxes and furniture into the five waiting Smart Vaults. This will be a challenge because we have never handled this kind of packing before. Stay tuned and we will let you know what we discover. That panelling in the workshop looks great. I wish I’d known about that in our basement, although here on the west coast, the price differential is probably greater. How wide is each panel? It’s hard to tell from the photo. By the way, I’m really enjoying this series. I was enjoying the factual reports and learning about the various contractors, techniques and tradeoffs, but I really got hooked when you posted about the rock a couple of weeks ago. That got me to the map and I realized that I have hiked and driven in the Floyd area. Add in some of your great photos and the events became real for me. I can visualize your move. Maybe a map would help some of your other readers? Anyway, thanks for the enjoyable posts. Good stuff here. I’ll be back on a regular basis. Good luck in Floyd County.